Didn't I tell you Samsung is serious about dominating all smartphone price categories? As if Samsung Galaxy Y is not enough to make the brand the leader in the entry level Android smartphone category this year, the Korean company recently announced Samsung Galaxy Pocket, which has almost similar specifications as the former but has a slightly smaller display. 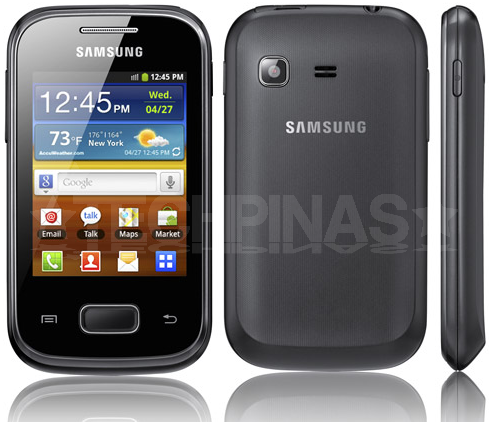 Looking like a shrunk version of Samsung Galaxy Y Duos or Samsung Galaxy Ace Plus, Samsung Galaxy Pocket - as a true entry level release - has modest technical specifications. It runs Android 2.3 Gingerbread with just an 832 MHz single core processor, and handles multitasking with but a measly 124 289 MB of RAM. Imaging and video capture are covered but only via 2 MegaPixel fixed focus camera with no flash and a QVGA recorder. The good thing though is that users can enjoy Wifi and 3G connectivity on this handset for easy access to online content and favorite social networking sites. Photos and specifications of this handset were fed to tech blogs from around the globe earlier this month. However, pricing and exact release date were left out. As yet, TP hasn't received word from Samsung Philippines regarding this handset but I'm guessing that it will land here in time for back to school season with an SRP of around Php 5,000. Obviously, this phone is made for young consumers, so kindly share this post with them.